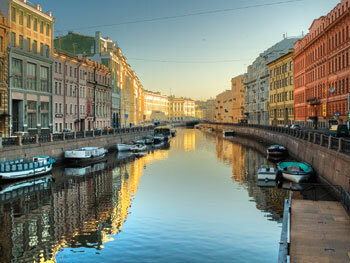 Learn Russian in St Petersburg, one of the most beautiful cities in Europe! 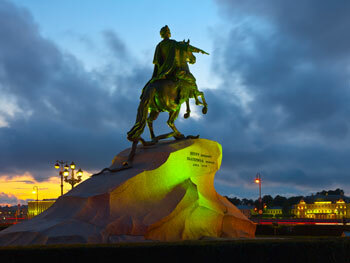 Having seen several changes of name over the last century, being called Petrograd and Leningrad at various times, since 1991, the city has reverted to the original 'St Petersburg', named after its founder, the Russian Tsar, Peter the Great. The second largest city in Russia, St Petersburg was the Imperial Capital of Russia for two centuries. Although Moscow is now Russia's designated capital, St Petersburg is an important cultural centre with elegant baroque buildings, historic palaces and countless museums dedicated to history, literature and art, not forgetting the splendid theatres hosting musical performances, ballets and plays. The list of St Petersburg's attractions seems endless, but no visit would be complete without a visit to the iconic Hermitage Museum, the Winter Palace and the Church of the Saviour on Spilled Blood. 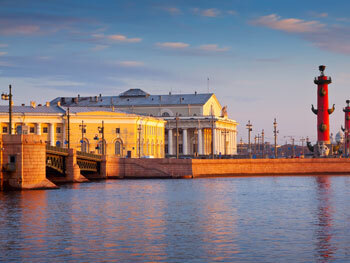 Almost everyone will require a visa to take a course in St Petersburg. 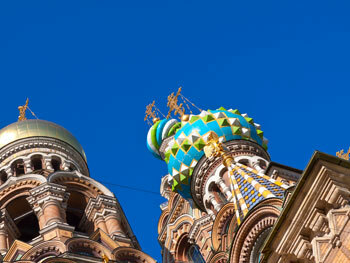 Our guide to Russian visas should help you to decide which is the most suitable for you. Our school in St Petersburg is located in the historic centre, on the southern edge of Arts Square where you will find the Russian Museum. This great location just a short walk from the famous Nevsky Prospect and Mikhailovsky Theatre. The school occupies a historic building which has been renovated with modern facilities. There are 13 classrooms which overlook a quiet courtyard. Each classroom is equipped with an Apple TV box and iPad, allowing teachers to use the most up-to-date teaching materials in lessons. Wifi access is also available throughout the school. Our school offers a wide variety of language courses, suitable for students of all language levels. Students wishing to learn Russian in a group environment can choose between the Intensive course which includes 20 lessons each week, covering the full range of language skills including reading, writing, listening, speaking and grammar, or the Super Intensive course which includes 5 additional lessons each week, concentrating on cultural topics tailored to your level of Russian. Outside of the summer season you can also take part in a Semi Intensive Russian programme in St Petersburg. The lessons take place between 15:00 and 17:50 Monday to Friday. Smaller class sizes of just four students maximum ensures you get the most out of the 15 afternoon lessons each week. If you want to learn as much Russian as possible during your course in St Petersburg, it is also possible to take a course of private lessons, either taken alone or combined with a group course. Students who study Russian at our school in St Petersburg stay with carefully selected, Russian speaking host families, or else in a shared apartment, staying with other students taking Russian courses at our St Petersburg school. We would always advise that students who want to learn Russian as quickly as possible, stay with a host family, as the families have been carefully selected to offer a warm welcome to our students and help students to learn the language skills they study in class by speaking in Russian. Both bed and breakfast and half board meal plans are available, giving students the opportunity to sample traditional Russian meals. Our Russian language school in St Petersburg also arranges accommodation in self-catering apartments, shared with students from our school. The apartments are usually shared by 3-4 students, who will each have their own bedroom, but share the bathroom and kitchen. Each apartment is full furnished and equipped with a washing machine and wifi access. The activity programme run by our school ensures that students enjoy their time in St Petersburg, as well as helping them practice their Russian. Like our other schools in Russia, our St Petersburg school also offers an extensive cultural activity programme, with guided themed tours of St Petersburg. These include Romanovs to Dostoevsky tours and even a St Petersburg metro tour. Day trips to Peterhof, Novgorod the Great and Pushkin, as well as various masterclasses arranged by the school will also enhance your new Russian language skills. There is also much more to see and do with your new Russian speaking friends. You can visit museums, Russian steambaths, try ice fishing in the winter or take boat cruises on the River Neva in the summer. You may also like to visit the incredible Hermitage Art Gallery, Yusupov Palace, Tsarskoye Selo and more! On arrival into St Petersburg, a one-way airport transfer is included free-of-charge from the airport or train station for all students booking accommodation along with their Russian course. Average score for our school in St Petersburg (Historic Centre) based on 17 previous client reviews. Was acording to my expectation. Very personal and every day new grammar. After two weeks we really progressed. Very kind family and correct meals acording to my thoughts of sharing and living with a typical russian family. I learned a lot, had to study hard. I went to St. Petersburg and Moscow. I liked St. Petersburg the best, because this school provides a little bar/meeting place, where I had contact with many students. The teachers were wonderful, they made my study a real pleasure. 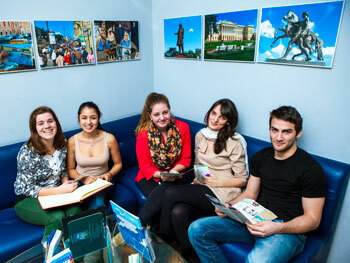 The language school was very well organised and very welcoming, making me feel secure and at home instantly. I had individual lessons and so obviously everything was well tailored to me ability and confidence level. The teacher was extremely helpful, ensuring that I made plenty of progress without feeling out of my depth. I learnt loads! The accommodation was basic but everything was clean and the lady I stayed with was very pleasant. Learn the Russian language in Russia, a wonderful and fun way to submerge youself into the culture and language. The St. Petersburg and Moscow schools are well equiped with professional teaching methods making learning fun and most enjoyable. Living with a host family is exciting and helps you to ease into the culture and language while allowing you the freedom to do what you want. Simply go for it, nothing ventured nothing gained and you will gain so much and want to come back for more. The teachers were excellent and my knowledge of the Russian language has improved greatly. The course was excellent, and both teachers were very skilled. They conducted the course in a way that helped our learning (unlike my lectures at university), and my language skills have improved immensely. The college itself is modern and very friendly, and the classes were small so there was plenty of individual attention. My accommodation was fantastic: clean, well furnished and the best flat of any of the other students at the college. I loved it. I had the most fantastic time in my 2 weeks in St. Petersburg, my language skills have improved enormously and I have far more confidence, and I can't recommend the college highly enough. An excellent standard of tuition, with patient and understanding tutors that made the day to day learning a lot of fun, with very professional and friendly staff. Highly recommended! My accommodation was comfortable and clean. Easy access to and from school and also into the heart of St Petersburg. The thought of doing a language course in a foreign country was something so far out of my comfort zone that I almost turned back enroute to the airport. I am very glad that I did not. What an amazing experience, it is something that will live with me a long time. I thought the course was really good. I learned a lot and found the teacher very good. I would recommend the course to others. Impressed by the fact that language teachers very rarely resorted to the use of the English language and nearly everything was communicated through Russian. The timing of the lessons etc. was perfect and gave enough time for afternoon siteseeing. The school was very organised and met my expectations. They put me in the correct group for my level of Russian and the teachers did their outmost to help all members of the group to improve their level of understanding the language. The apartment I was leaving in was very clean, the lady I was staying with was a jewel, very helpful, very friendly, a good cook and always tried and succeeded in making my stay in this russian city unforgettable. Quite possibly the best host family I've ever come across! The lessons were aimed at getting an understanding of the basics of this complex language. I had an excellent teacher, who was pleasant, thorough and attentive to all and each one individually. As there was only 4 students in our class, that enabled rapid achievement of an average rate suitable to all. The course was very good and I thoroughly enjoyed it. The atmosphere was great, and the quality of teaching was very high. My accommodation was good, I enjoyed staying with a host family and getting to sample some Russian food. My one to one course of Russian in St. Petersburg was every thing I expected it to be. My host family was very obliging and they did every thing they could to make me feel comfortable. I felt being taught entirely in Russian (including grammar) was important for developing an ear for the language, and the friendly style of teaching was helpful in encouraging me to learn more. The host family were extremely helpful when my baggage didn't not arrive, my room was extremely comfortable and the cooking was excellent. 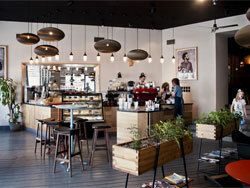 Top six food-related places in St. Petersburg! PLEASE take me back to St Petersburg!